Posted 9:16 am by Chris & filed under Farm Equipment. 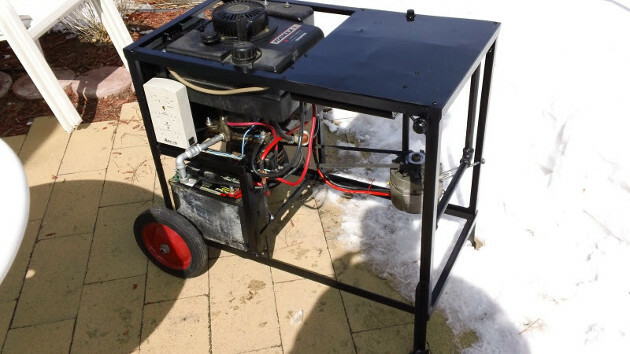 When I built this Generator, we were living at 7,000 feet elevation in Colorado. Our house was heated by gas, but the heater would not function without electricity. We lived with extreme cold weather, where I could not even go outside. The wind chill can be well below 30 degrees Fahrenheit. Just to breathe a little bit of those stinging ice crystals and the cold air made my chest hurt and ache! Our gas stove will provide a little bit of heat, but not enough to keep the water pipes from freezing. We needed heat tape on our water pipes to keep them thawed. Without heat, our house is pretty much a shell. I hated the feeling of hopelessness, no heat means no water as the pipes freeze even with the water running. You know how it feels when you are cold. No way to get warm and you have all of your clothes on while waiting for the power to come back on! What do you tell your children when they are cold and hungry? The pain in the pit of your stomach grows as you have no way to take care of them. It is a feeling of hopelessness when you have to wait on “The Electric Company” to fix the problem. I have been asked to write about generators by some of my friends and people who read my blog. So here you go. You have made the decision to build your own Emergency Power Generator. One of the first things that you need to do, is the planning. You are taking a journey to self-sufficiency and preparation that will help you , your family and those who you know and love. You will also have some decisions on your own to answer, depending upon what materials that you gather. Remember, you are not building an airplane that people will fly in. You are building a power generator and it is ok to improvise a bit. If you are unsure of something, you can ask for some help. You can take a picture, send an email,and I will answer you back. Some of my answers will be more questions if I do not get all of the information needed to give you a correct answer. But I will answer you. The best solution that you can find involves action and asking questions when you have them. Contact us using the information in the resources section of this post. Being ready for a power outage, no matter what climate you are in, is important. We are only going to talk about gas powered generators. 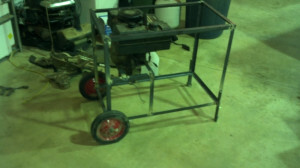 Reason for that is that gas powered engines from lawnmowers are easily accessible and inexpensive when purchased used. The first step: Determine how many watts are required to run all necessary equipment. Begin by making a list of all equipment that you want to run during the outage. Also keep in mind why you are building your generator and your budget. If you are going to use your generator for emergencies only, you would base your decision on the highest power consuming appliances that you have. In hot climates where cooling is a major concern, your air conditioner will be the highest power consumer. Use power cycling for the Air conditioner during the hottest part of the day. Then cycle through the other items as needed. Such as the refrigerator, freezer, television and charging batteries for your other equipment. Keep in mind your health first and other items second. You can also cycle use of your Air conditioner, refrigerator,television,stove and communications throughout the day as you find the need.For those of you willing to spend a little more money and want to have all of your modern comforts, Purchase a larger power inverter and a larger generator. So during a disaster or even a camping trip, all of your powers needs will be met. To ensure that you have plenty of power available, add up all of the power needed by device in watts and as a good rule, multiple your total Watts required by 1.25. This gives you a safety buffer to ensure that everything works as it should without damage. To figure out power requirements we need to determine watt. Not every piece of household equipment tells you how many watts it uses. If you can’t find the wattage rating, look for volts and amps, multiply them together and you have your power requirements in watts. Most household appliances in the United States use 115 volts of electricity, excluding washers and dryers which may use 220 volts. Transformers convert 115 volts back to DC voltage for your smaller electrical equipment. Record the Voltage and Amps that your appliances require, multiply those numbers and you have your power requirements in watts. If the watts are listed, use the manufactures numbers. For example my friend (located in California) has a decent size upright Air Conditioner that puts out 12,000 BTUs (British Thermal Units) which is measure of energy used for cooling & healing. Looking on the air conditioner he was able to find the following information. If he was unable to find the wattage for the air conditioner then we could figure it by the following 115 Volts x 12 Amps = 1380 Watts. Notice the company rating was close but not exact…. remember why we mentioned multiplying the total by 1.25? Add up the total amount of wattage needed and record that. Armed with that information, we start gathering material for your generator. Not all equipment will use the same amount of energy, so do your homework. Remember this is only to give you an idea, and you should measure your ACTUAL power needs. One of the best ways to lower your expenses for building your power generator is to purchase used parts. They are available in your local paper, Ebay or Craigslist. One exception to buying used parts is the power inverter, because used inverters may not work and do not come with a warranty. 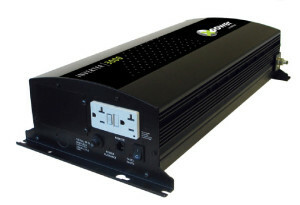 I had purchased a new XANTREX XPOWER 1000 WATT POWER INVERTER & 2000 WATT SURGE AC/DC CONVERTER GREEN for $89. This gives a continuous use of up to 1,000 Watts, but can handle the startup surge to 2,000 watts. Make sure that you always buy a new power inverter. You can always add an extra Power inverter. A 5 hp vertical or horizontal shaft engine: running but not new. Ask any of your friends or neighbors if they have one. $50 should be a good price if you want to offer to purchase one, but make sure it runs. You may be able to get a complete mower to use the motor as well as other parts. Get the entire riding lawn mower if you can. 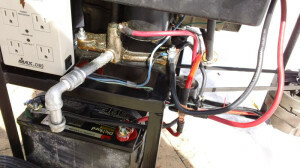 Your generator will have a starter motor (no need to pull-start your engine). You can use the wiring and the wheels for your Generator, plus you get bolts, belts and possibly even a metal cover for your generator! Remember to recycle the scrap metal. 1000 Watt inverter with a 2000 Watt surge AC/DC converter Green for $89 shipped to our home. We purchased it on Ebay. 2 wheels for rolling the generator from place to place. Our cost was $0. I have seen them for less than $5 a pair at garage sales, sometimes free when purchased with other items. 2 large bolts for mounting the wheels to the frame. 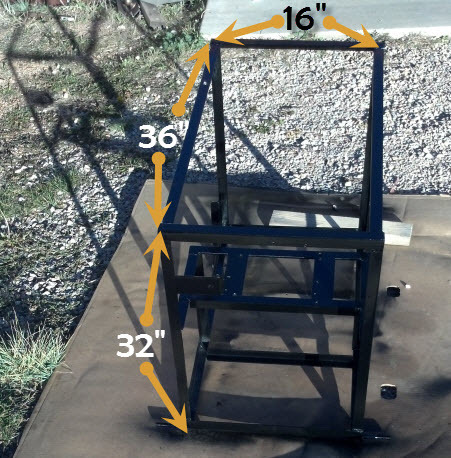 Angle iron – 40 feet of 3/16″ thick by 1″ wide angle iron to build the frame. I purchased all of the metal from a local steel shop for $20 and had some left over. A working heavy duty truck or car alternator. If you do not have one, a friend or neighbor may. A junk yard will sell you one, but make sure they test it with you there at time of purchase. $20 to $50. Our cost $0, We had some spares after working on different vehicles. They can easily be repaired, ask your local car parts store if they have any rebuildable cores that they may sell you. Black or galvanized pipe for handles and mounting supports. $10 to $20. Quart of 30 wt oil. 4 Gauge Wire for the alternator , batteries and starter. 10 Gauge Wire for the electrical power cables. Volt Meters for your generator control panel. Used car or truck battery still in good condition. Your time: It is a project to learn and enjoy. You get paid in satisfaction. Your cost for labor? $0. Our out of pocket expense was right around $189. If you can’t weld or have a friend that would do it for you, improvise. What skills or materials do you have that you can trade for welding? Or you can always bolt your frame together if needed. Measure the height of the engine from the bottom of the base to the top of the engine. Measure the width of the engine from side to side. Measure the width of the engine from front to back). Measure the distance from the back engine mounting holes to the front of the mounting holes. Measure the distance from the left side engine mounting hole (front) to the right side engine mounting hole (front). Measure the distance from the left side engine mounting hole (back)to the right side engine mounting hole (back). Note: The engine mounting holes are not always equally spaced. Ensure that size of the pulley on the engine shaft will fit easily through the opening left by building the engine mounting bracket. Measure for Alternator placement to ensure alignment with the Engine Pulleys. This will be a rough estimate to ensure that the Alternator, once installed will be able to be mounted in the complete frame. The Pulley that turns the Alternator must be able to align exactly with one of the two pulleys mounted to the bottom of the engine. You will accomplish this by holding the alternator pulley in alignment with the Engine pulley. It is best to use the pulley on the top of the engine shaft, and measure the distance from the bottom of the Alternator to the top pulley of the engine shaft. Again, this will take some adjustment and creativity. You will now take that measurement, and add the Engine height from the previous engine measurements. Add an extra 4 to 6 inches to determine the actual height of the Large portion of the generator Frame. Called “The Box” from this point forward. Now that you have your measurements, you will determine the Height, width and length of your “Box” Frame. The measurement from your Engine + Alternator height will determine the height of your frame. Note: Remember, if you your engine has a pull starting option, ensure that the top of the engine will sit Above the top of the Frame to allow easy access. If the engine does not have that option, you can allow the engine to sit below the top of the frame. That will allow you to build a cover for your generator. + 8″ to ensure pulleys align properly a safe distance underneath Alternator. The length of the Box is determined by adding the length of the power inverter to the distance to the forward side of the engine then adding an extra 4 to 6 inches dependent upon any accessories you wanted to add while also giving a cushion of room. 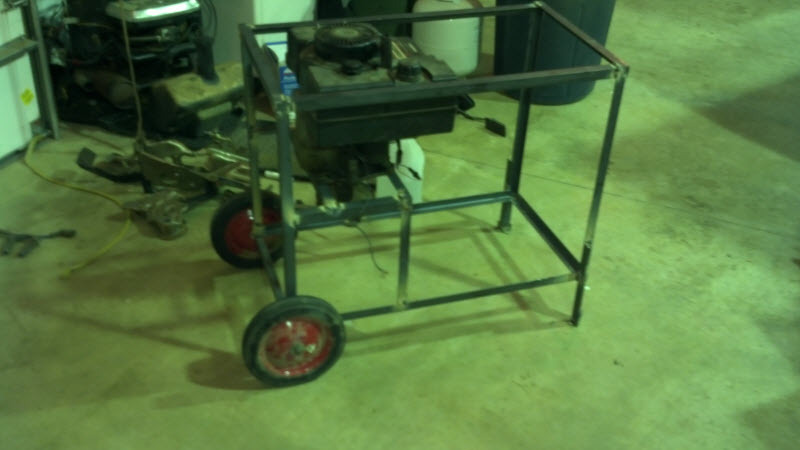 We added a folding handle on the end of our generator. You will determine the width of your Box Frame by adding 1/4″ to the width of the engine side to side measurement. Note: Remember using angle iron, you will be facing the angle inward toward your generator interior. Now that you have your materials together, let’s start with the frame. Cut the Angle iron using a hack saw for the basic box and clamp together. You can use Angle Iron that you purchase or an old bed frame if you have one. Making sure that the engine fits easily inside of the box by placing the engine inside of the frame. We start by building two metal frames for the ends of our generator frame. 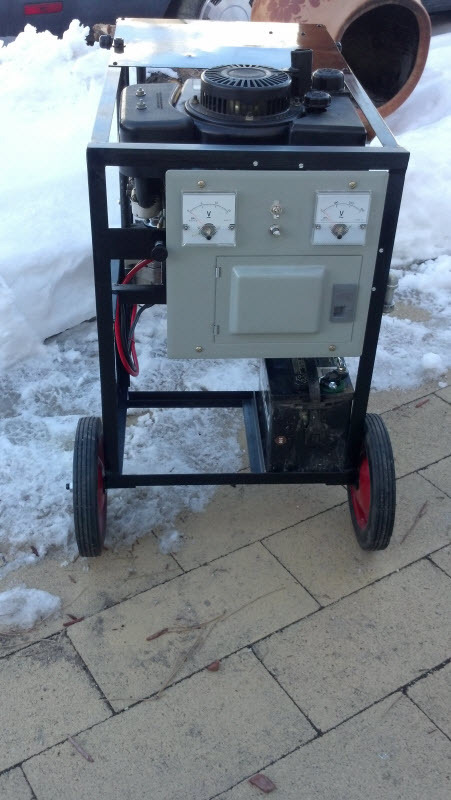 These sides of our generator are 32 inches high by 16 inches wide. Remember, your dimensions may be different depending upon your engine size. Cut 4 pieces of Angle iron 32 inches long. Cut 4 pieces of Angle iron 16 inches long. Grind the inside corners to ensure they fit together tightly. Square the 2 separate sides (ensuring 90 Degree angles). Clamp together once they are square. Either weld them together or bolt them together. Now that we have the ends built. Connect each of the two end frames to the sides and complete the “Box”. Our completed frame is 36 inches long. Cut 4 pieces of Angle iron 36 inches long. Grind the corners so that the pieces will fit together to Make a box. Square the box and place the clamps or vise grips to hold in place. weld or bolt the box together. Verify that all pieces are square (90 degree angle) at all corners. Verify that all of the measurements from corner to corner are the same. 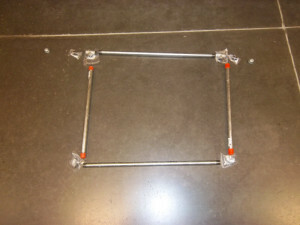 Square the frame using your Measuring tape, square and level. Weld or bolt together. (If you are bolting the frame together, drill two 1/4″ holes in each corner. This will ensure that you will get a solid frame. Use 1/4″ bolts and nuts to connect the angle iron if you are bolting it together.) I had a friend of mine, Brian, weld mine since I have a pacemaker. Arc welding will either shut off a pacemaker, or bump it up to an unsafe level. To make it easier to work on the rest of the project, we will now install the wheels on the rear of the Box Frame, as well as make 2 legs for the front of the frame This will allow the frame to sit level and square. If you are using bolts for the wheel mounts, Cut off the head of the two bolts if you are going to weld them in place. If you will be bolting the wheels in place, use all thread that is the same diameter as the holes in the wheels that you are using. For all thread mounting, the rod needs to be long enough to run the entire width of the frame (ours is 16 inches) plus the width of the wheels (ours are 2 inches wide) plus enough thread to allow for washers and lock washers. You will need 4 nuts to attach the wheels as well as lock the all thread rod in place from side to side inside of the frame. You will install the all thread rod with the interior nuts already attached, allowing for installing the rod into the frame. Now you will center the all thread rod with the extra threads sticking out evenly on both sides. Tighten the nuts to prevent any movement of the rod. Place the spacing washers against the frame on both sides. Install the wheels, one on each side. Install the spacing washer on each side. Install the lock washer (each side). Now it is time to make and install the front legs to get the frame level. This will also keep the generator stable while running. Clamp the 4″ “foot” to the “Leg” angle Iron. Clamp the “leg” to each side of the front of the frame. frame when the frame is level front to back and side to side. 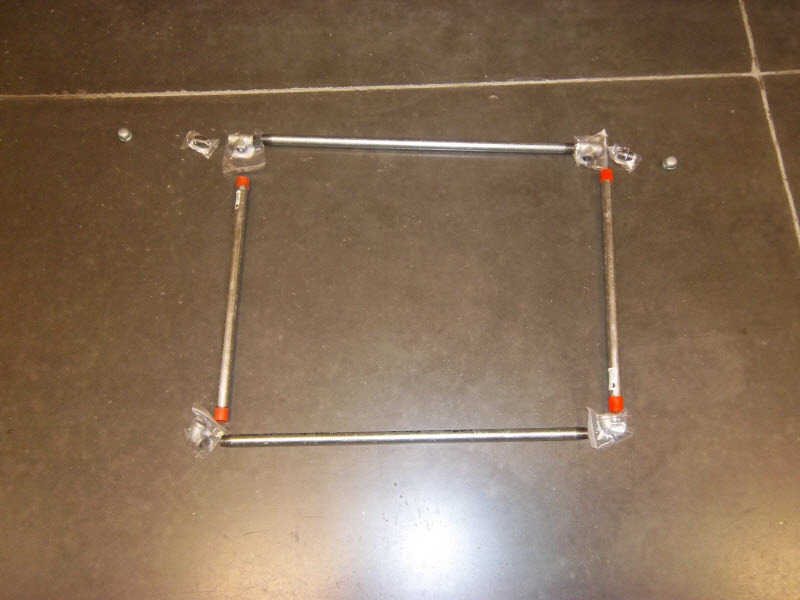 frame using 2 – 1/4″ bolts. You will now cut your pieces of angle iron to build your engine mount supports. Our engine was 12 inches in height from the base to the top of the engine. We have a pull starting option so we want 2 inches to protrude (stick above) the top of the frame. Therefore, our engine mount will be 10 inches below the top of the frame. Cut 2 pieces of angle iron 22 inches long. Cut 2 pieces of angle iron 8 inches long. Build the engine mounting base for the engine to sit on, by attaching angle iron with enough room for the Engine pulley to line up with where you will mount the alternator. Our Engine requires 22 inch legs to support the engine. Add angle iron to make the bracket mounts by welding or bolting them on to the frame using the 16 inch cross support pieces. 2 side to side and 2 front to back . Weld or bolt the bracket in place to mount the engine. Now you will also place the 2 – 8″ pieces 6″ apart in the center of the bracket to add strength. These pieces also allow for “fine tuning” (adjustments) of where your mounting holes may be placed. (Note: Each engine will have different mounting holes for installing the engine. By measuring the mounting holes of the engine, you will decide where to drill the holes for the mounting bolts. The easiest way to accomplish this is to test fit the engine in place, then mark the holes for mounting the engine.) Remove the engine once the holes are marked. Drill the holes and mount the engine back onto the engine mount using the bolts that you have acquired. You will see from the picture of the test fitted engine, there was 1/4″ clearance on either side of the engine, side to side, to place the engine onto the mounting bracket that you either welded or bolted on. Once the engine is mounted on the mounting bracket installed as part of the frame. Use the mounting bolts that came with the riding mower or find or purchase new ones. Now you will attach the battery mount support. You will need to measure the battery that you have acquired. The battery or batteries will fit length wise from back to front underneath of the engine. You will use a piece of angle iron and mount it from side to side. Place the battery mounting support under the engine from side to side. Place the battery in the frame, moving the support to where the battery fits snug but will pull out easily. Clamp the support in place and either weld or bolt it in place. Measure the distance from the back of the frame to the support piece. Cut one piece of angle iron for each battery that you will install (we used one battery). With the battery installed, place the battery “hold down” piece that you just cut, next to the battery, flat side against the battery. Clamp that piece in place and drill a hole in both ends using a 1/4″ drill bit. 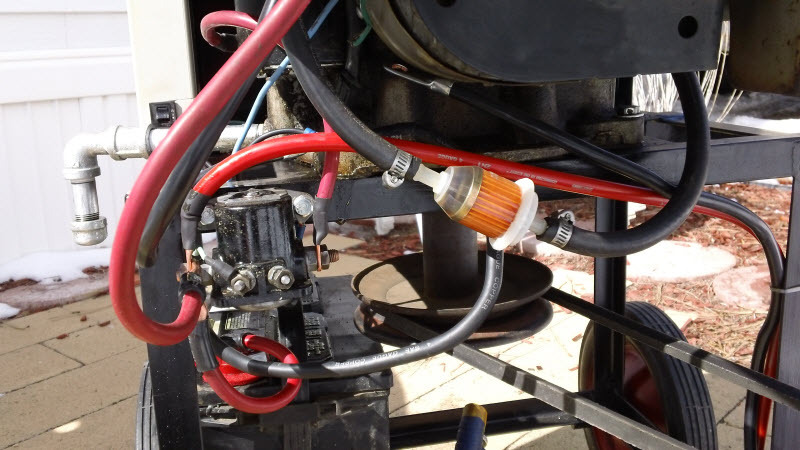 Use 2 – 1/4″ bolts 5/16″ long and 1/4″ wing nuts to attach the “battery hold down” in place. Install the bolts from top to bottom. This will keep your battery from moving during operation. Lay out and attach the Alternator Bracket. We attached the Alternator to the frame using 1/2″ Galvanized Pipe using all thread (threaded rod) that fits inside of the pipe. We measured how far from the bottom of the “Box” frame that the bottom of the Alternator needed to be to ensure proper alignment. We cut the pipe so that it was in two pieces. The short piece was on the bottom. We drilled 2 holes in the frame for the all thread to go through (one on top and one on the bottom, straight and checked with a level). Now cut the upper part of the pipe to fit tight against the top of the alternator and the top of the frame without bending the frame. 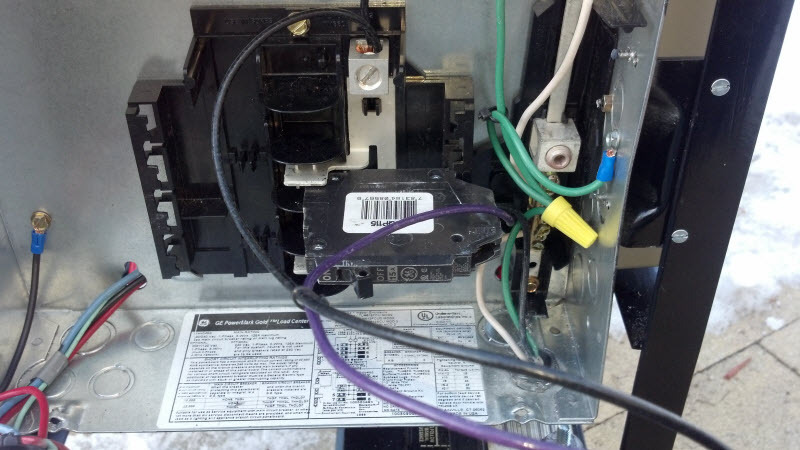 Test that all of the components that you installed are connected correctly per the wiring diagram (located at the bottom of the post). 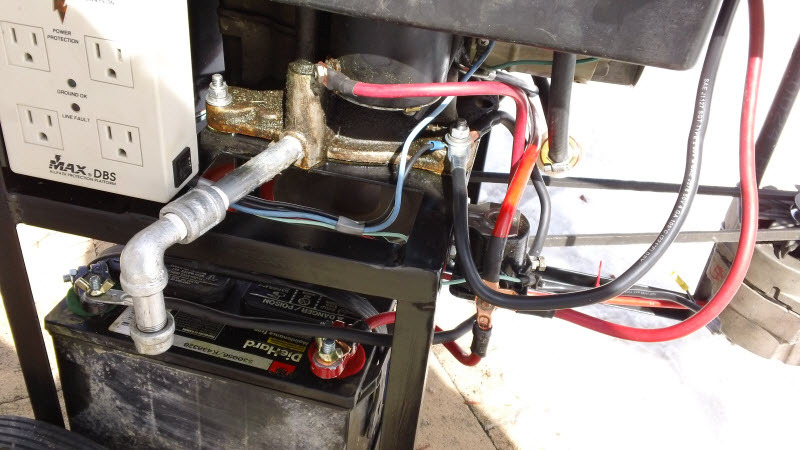 Start the engine and verify that the voltage is correct from the battery and the alternator using the voltmeters that you either purchased or came with the mower. Using a power grinder or a rough then a fine tooth file, remove the rough edges on the frame. Wire brush the frame to prepare for painting. 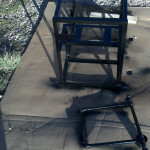 Paint the frame with two coats of a good quality rust resistant outdoor metal paint. 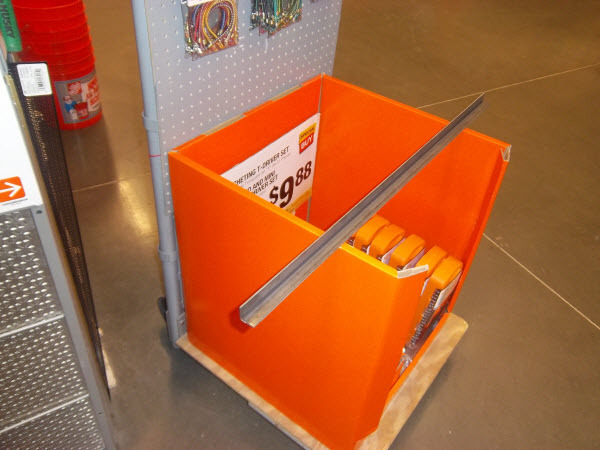 You can find good brands in any hardware store. One brand is called Rustoleum. 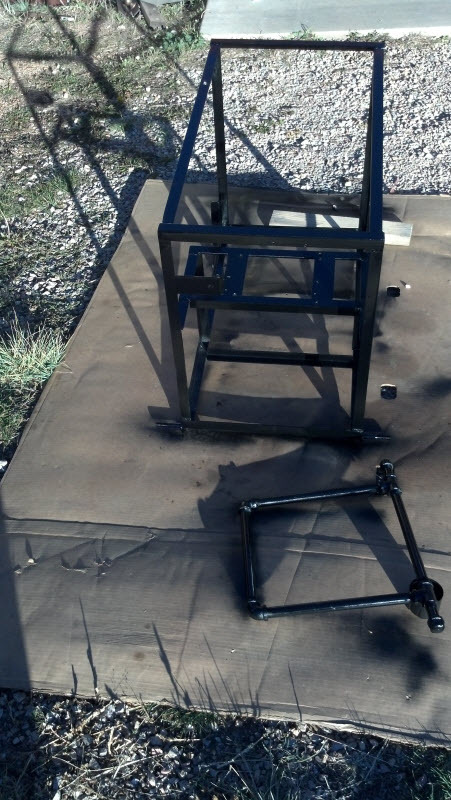 The top picture is just the frame after it was welded and painted. inverter(s) as well as the battery(ies) and the alternator. The Mower engine turns a pulley. The pulley turns the alternator which is connected to the battery(ies). The alternator keeps the battery charged. 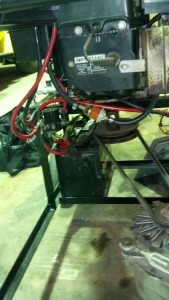 The battery and the alternator are both connected to the power inverter with 4 gauge wires. 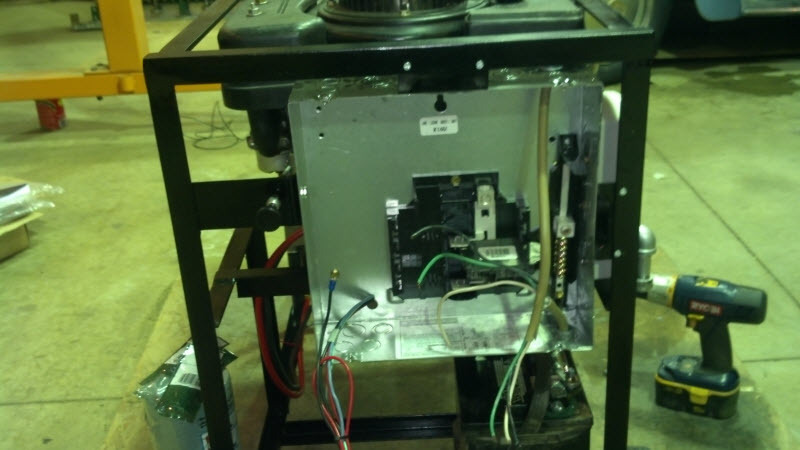 The engine is turned on, started and stopped using the switch mounted on the face of the power control panel (mounted to the frame using angle iron brackets and bolts). The wiring is connected using electrical lugs (connectors) . The wire is ran in such a way as to protect them from being damaged from any moving parts. The wiring connected to the inverter from the batteries/alternator provide the 115vac from the inverter. enclosed wiring diagram for completion.